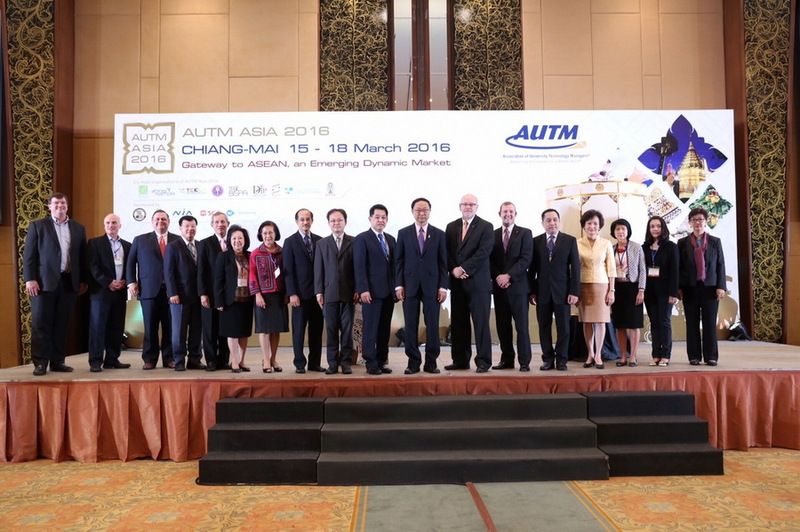 17 March 2016 - in Chiang Mai / Dr. Pichet Durongkaveroj, Minister of Science and technology presided over the opening ceremony “Association of University Technology Managers, Asia 2016 (AUTM Asia 2016)” organized by the National Science and Technology Development Agency (NSTDA), National Science Technology and Innovation Policy Office (STI), Thailand Centre of Excellence for Life Sciences (TCELS), The Thailand Research Fund (TRF), Prince of Songkla University (PSU), Chulalongkorn University, Office of the Higher Education Commission on Higher Education (OHEC), Department of Intellectual Property (DIP) and Thai Business Incubators and Science Parks Association (Thai-BISPA) aiming to support the development and transfer of technology and being a driving mechanism to bring research results from academia and research institutions to commercial exploitation. Speakers from around the world, and the personnel involved in the management of technology and innovation of Thailand, have attended the event. The event, was held from 15 - 18 March 2016 at the Shangri-La Hotel, Chiang Mai.